My recovery had been moving along quite nicely and I was feeling great! Then on Tuesday morning, after a not so great night's sleep, I woke feeling rather crummy. I tried going into work but only lasted 2 hours. I came home and went to bed. After a few hours of napping I didn't feel any better so I called the doctor's office and got scheduled for an appointment first thing in the morning. That appointment was followed by a CT Scan which showed fluid built up in my abdomen so now I am on some serious antibiotics and we will see what happens. I am feeling better so that is a good thing but now everyone is telling me to rest! Do you know how boring that is? I have spent a little time sewing but not much. I did manage to get three bindings finished before it got just too hot and got the blocks done for a baby quilt. Here is one possible layout. I need to send the pictures of layout options for the baby quilt to the person who ordered it so I know how to put them together. 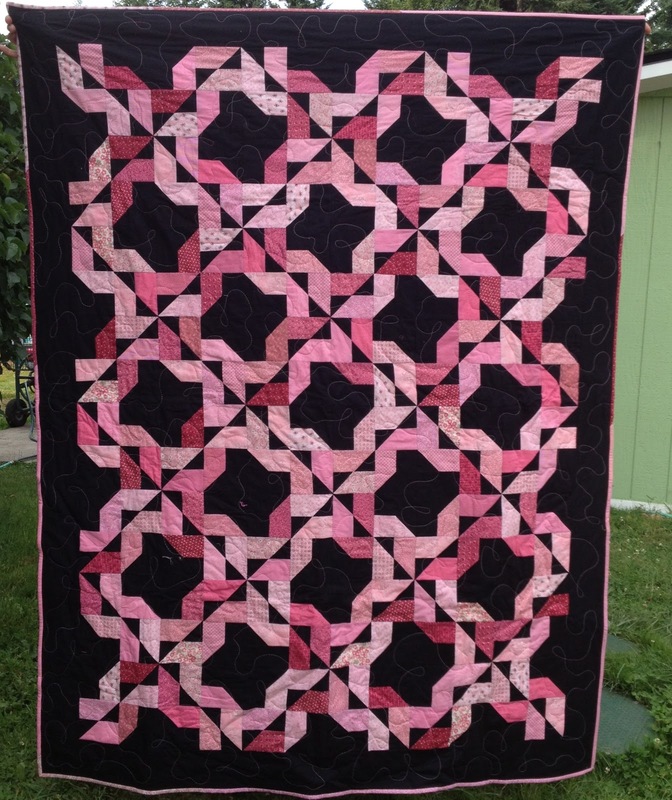 Today the quilt for the Margarita Party will be delivered and I just need a hanging sleeve on the one for the Bluegrass Festival and that can be delivered also. Did you notice that the baby quilt is made from the leftover HSTs from the Margarita Party quilt? Today I hope to finish the last binding and maybe get that hanging sleeve done while I watch Harry Potter and the Prisoner of Azkaban. I do need to find something else to do work on or I am going to go stir crazy!